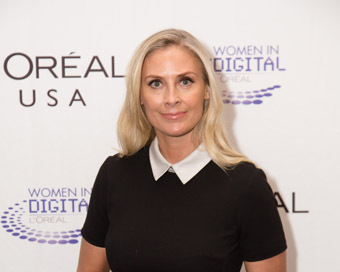 L’Oreal has announced Grainne Barron, CEO and Founder of Viddyad as the winner of The L’Oreal Women in Digital Award 2016. Grainne pioneered technology in automated video ad creation and real time distribution. She is recognised with the Women in Digital Award for her technological innovation and vision. The Irish woman joins the ranks of past Women in Digital Winners such as Victoria Eisner, Co-Founder of Glamsquad and Kelsey Falter, Former Founder and CEO of Poptip, which was acquired by Palantir in 2014 and who themselves have raised US$2 billion. Past Women in Digital winners have raised over US$300 million in funding. Barron was one of three finalists invited to present at L’Oreal’s Inspiration Day on September 16th in front of more than 500 L’Oreal Senior Marketing Executives. Judges included Arianna Huffington, Founder of The Huffington Post and Frédéric Rozé, L’Oreal USA CEO. Other finalists were Morgan DeBaun, founder of Blavity; and Grace Woo, founder of Pixels.IO. Barron, who previously won the WEB Summit Spark of Genius Award and the PwC Most Innovative Startup award, is ready to collaborate with the L’Oreal brand on a global scale. “This is a great opportunity for Viddyad. We are honored to be welcomed into the L’Oreal family and look forward to a close partnership with them,” said Barron.